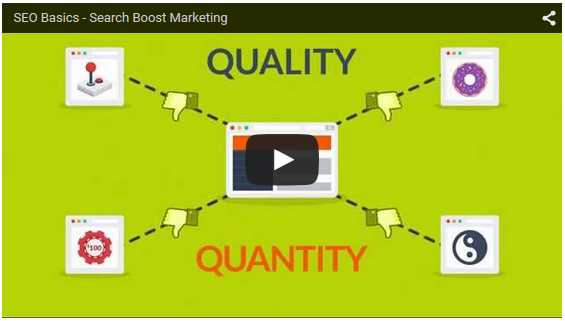 Watch the latest video from Search Boost Marketing about seo basics for better website rankings. Lets talk about seo for a bit. A lot of people think it’s some kind of magic or trickery. But, that`s not the case at all. Just take a look at it from your perspective. What do you do when you want to find something on the internet ? You search for it … right ? Then you probably click on one of the search results on the first page. Just like most people who search online for things. In fact approx 90% of searchers behave the same way. Ever wonder how the websites at the top of the search results got there ? It’s because they were search engine optimized. Exactly how search engines work is a closely guarded secret. But we do know two of the main principles. Keywords and links. Lets focus on keywords first. Your chances for better rankings occur when your website contains the same keywords that are being searched. Keywords are more effective when found in certain places on your website such as the title, url address ad H1 headings and a few more places. But you must be careful, quality over quantity is the best rule if thumb. Some so called seo experts try to fool the search engines with some sort of ridiculous high keyword occurrence. Instead they should be focusing on quality content first. Now, lets talk about the links. Websites that link to your website basically tell search engines that you have some good stuff there. But agin the best rule of thumb is quality over quantity. Links from poor or irrelevant websites won’t help you get better rankings online. Now what we just talked about is really just a basic introduction to seo for website rankings. In reality it’s not a simple task at all. Seo experts agree there are about 200 ranking signals search engines use to rank a website. To do well with seo you definitely need some help from a professional. Someone like us. We will develop a custom seo strategy specifically for your business. We will help identify the right keywords, write friendly site code and figure out the best linking tactics and places for your industry. But more importantly we will help you find ways to provide high quality content for your visitors and search engines as well. Go ahead and contact us today for a free no obligation quote !